Another spin-off from our Patriots & Tyrants line, this vinyl sticker should be placed wherever one happens to respect the US Constitution, and our right to free speech. Car & home windows, laptops, refrigerators, etc all make good 1st Amendment Areas. While the US Government is busy "defending" the Constitution against those who would see it left alone, they have this new habit of setting up '1st Amendment Areas'. Supposedly, this is to protect US Citizens' right to petition government for redress of grievances, without fear of punishment or reprisals. 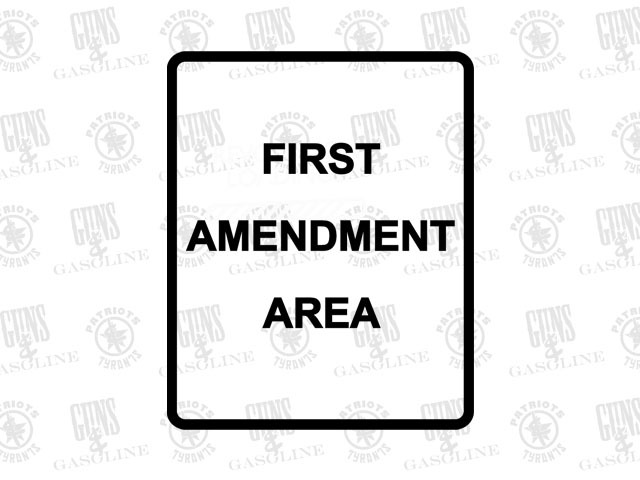 Why not have a mobile 'First Amendment Area' around your person, at all times? Would you like to wear your First Amendment Area? Wear the shirt, available here.